As far as compact SUV’s go, the 2019 Toyota RAV4 is at the top of its class. More attention has been given to the expanded interior, with added soft-touch surfaces and dashboard trim. 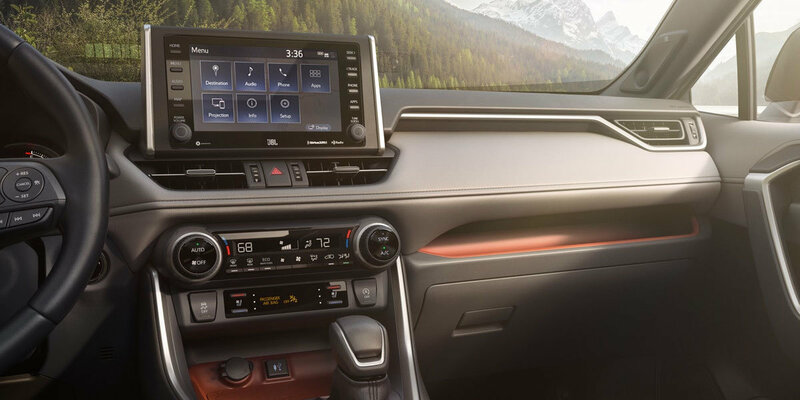 Take charge of your environment with intuitively placed steering and dash controls, while a 7-inch multi-information display alerts you to everything that is happening with your RAV4. An 8-inch center dash touch-screen unit commands a suite of multimedia features. With EnTune™ and Apple CarPlay®, you can choose a soundtrack for every journey. Having a fun night out with friends at the Iron Horse Tavern? Start the pre-hype party with a banging 11 speaker, JBL Clari-Fi™audio system. Do you have a growing family? Remember that the 2019 Toyota RAV4 is still hailed as one of the best family cars around. As the driver, you can claim the Qi-compatible phone charger while 5 USB ports make sure that everyone can power up their devices. Loaded with Toyota’s 5-Star rated Safety Sense™ 2.0 system and eight airbags, you can drive with confidence that you and your passengers are well protected. The frame of the 2019 Toyota RAV4 has an expanded wheelbase giving you more responsive handling, stability and a sportier look. Add an aggressive grille design, front and rear LED lights, a chrome dual muffler system and 19-inch wheels, for a winning aesthetic! Whether you are taking in a play at the M.T. Pockets Theatre or enjoying the excitement of the annual Coopers Rock WinterFest, the Toyota RAV4 does it all. Want something extra? 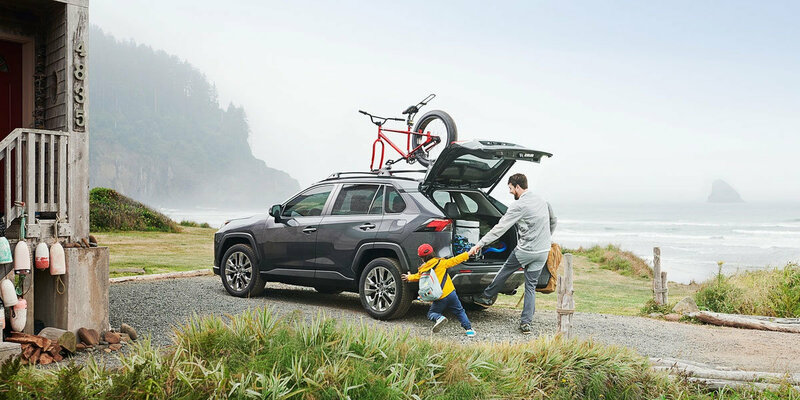 Check out the 2019 RAV4 Adventure model for a more rugged experience, while the 2019 RAV4 hybrid model delivers performance and features with an eco-friendly footprint. It is time for you to get a new Toyota RAV4! You just can’t pass up all of this performance and functionality stuffed into one great compact SUV. 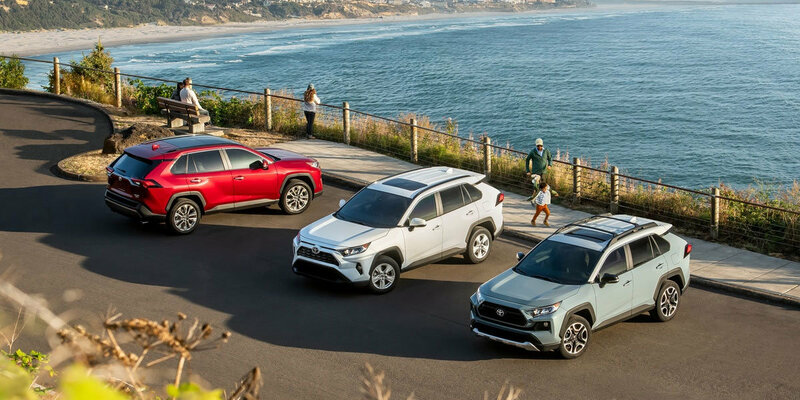 Take the 2019 RAV4 for a test drive today! University Toyota provides full-service, offering new and pre-owned Toyotas and Toyota TXM Express Service and parts. Our friendly and informed sales staff is waiting, call 304-244-3519 or Contact University Toyota, Morgantown, West Virginia’s Toyota dealer of choice. Instrument cluster screen size: 4.2 in. Instrument cluster screen size: 4.2 in. Instrument cluster screen size: 4.2 in. Instrument cluster screen size: 7 in. Instrument cluster screen size: 7 in. Infotainment screen size: 7 in. Infotainment screen size: 8 in. Infotainment screen size: 7 in. Infotainment screen size: 8 in. Infotainment screen size: 8 in. Includes front and rear all-weather floor liners and cargo liner. Includes cargo net - envelope, cargo tray, and roof rack cross bars. Includes heated leather-trimmed steering wheel and rain-sensing variable intermittent windshield wipers with de-icer function. Includes 11 speakers (in nine locations) including subwoofer, 8-in. Touch-screen, am/fm/hd radio, auxiliary port, usb media port, four usb charging ports, dynamic navigation with up to 3-year trial, dynamic poi search, dynamic voice recognition, hand-free phone capability and music streaming via Bluetooth® wireless technology, siri eyes free, apple carplay compatibility, siriusxm satellite radio with 3-month all access trial), and toyota connected services (includes safety connect and service connect with 3-year trial, remote connect with 6-month trial, and wi-fi connect powered by verizon with up to 2 gb within 6-month trial. Includes intelligent clearance sonar with rear cross-traffic braking and auto-dimming rearview mirror with homelink universal transceiver. Includes heated steering wheel, perforated heated and ventilated front bucket seats, rear outboard reclining passenger heated seats with perforated inserts, and rain-sensing variable intermittent windshield wipers with de-icer function. Includes smart key system on all doors and liftgate, hand-free power liftgate with jam protection, bird's eye view camera with perimeter scan, overhead 360-degree view in drive and reverse and curb view, and qi-compatible wireless smartphone charging with charge indicator light. Includes anti-theft system with alarm and engine immobilizer, entune 3.0 audio plus (includes six speakers, 8-in. Touch-screen with integrated panoramic backup camera display with customizable dynamic gridlines, am/fm/hd radio, auxiliary port, usb media port, four usb charging ports, advanced voice recognition, hand-free phone capability and music streaming via Bluetooth® wireless technology, scout gps link compatibility with up to 3-year trial, siri eyes free, apple carplay compatibility, and siriusxm satellite radio with 3-month all access trial), and toyota connected services (includes safety connect and service connect with 3-year trial, remote connect with 6-month trial, and wi-fi connect powered by verizon with up to 2 gb within 6-month trial. Includes heated leather-trimmed steering wheel, heated front seats, 8-way power-adjustable driver's seat with two-position memory function and lumbar support, and rain-sensing variable intermittent windshield wipers with de-icer function. Includes heated leather-trimmed steering wheel, perforated heated and ventilated front bucket seats, and rain-sensing variable intermittent windshield wipers with de-icer function. Includes intelligent clearance sonar with rear cross-traffic braking, digital rearview mirror with homelink universal transceiver, and qi-compatible wireless smartphone charging with charge indicator light. 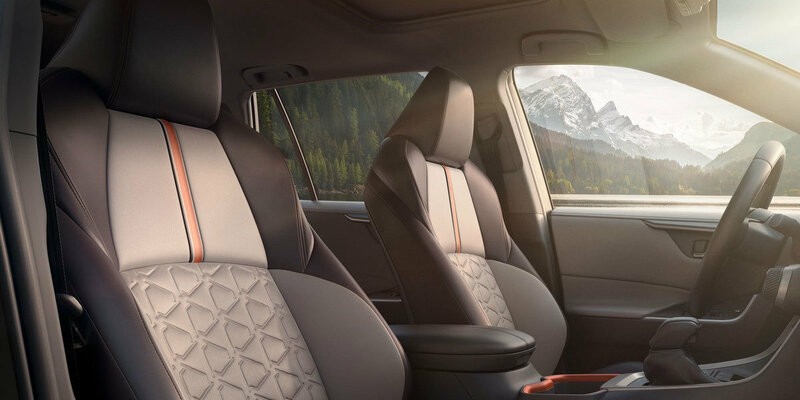 Includes 8-way power-adjustable driver's seat with lumbar support, heated front seats, and power liftgate with jam protection. Includes anti-theft system with alarm and engine immobilizer, entune 3.0 audio plus with jbl, clari-fi, and app suite (includes 11 speakers (in nine locations) including subwoofer, 8-in. Touch-screen with integrated panoramic backup camera display with customizable dynamic gridlines, am/fm/hd radio, auxiliary port, usb media port, four usb charging ports, advanced voice recognition, hand-free phone capability and music streaming via Bluetooth® wireless technology, scout gps link compatibility with up to 3-year trial, siri eyes free, apple carplay compatibility, and siriusxm satellite radio with 3-month all access trial), and toyota connected services (includes safety connect and service connect with 3-year trial, remote connect with 6-month trial, and wi-fi connect powered by verizon with up to 2 gb within 6-month trial.